One of the most disturbing aspects of contemporary life is that little do we realize how from the Himalayan heights of materialistic comforts and advancements in various fields, humanity is being led to the abyss of all-round environmental pollution, ecological devastation, ozone depletion, green house effect and so on. Is there anything more frightening than to be told that the earth’s forest covers are fast disappearing, the blue waters of the oceans that surround the earth are getting more and more polluted thereby the marine products which cater more than a half of humanity’s food requirements are getting depleted and earth’s canopy namely the sky is developing holes? This, in turn, would increase several-folds the temperature of the earth. To put more fright into us, we are now told that there are signs of ice melting in the polar-regions which would eventually increase the level of seas which would spell disaster of an unimaginable scale. Let us not forget that Man always lived in harmony with Nature and what sustained him in all the crisis he faced in his profound, courageous and determined march towards unraveling the mysteries of various kinds in his respect for all forms of life around him. What has guided him in this long, very often distressing and disappointing and at the same time lively search for identity, is the realization of how everything in nature is dependent on one another. This is the core of the ancient wisdom. The Buddhists explain this as “dependent origination”. A little book Gandhi wrote in 1909, the Hind Swaraj, highlighted the dangers awaiting humanity if it continues to neglect ecological concerns. The book invited both sharp criticism and appreciation. Many close friends of Gandhi advised him to withdraw the book. In the Hind Swaraj Gandhi described in graphic details the dangers inherent in man’s new-found enthusiasm in high-tech and machines. For reasons unknown, for many years this book was not taken seriously by many and even those who read it cursorily, led to believe that Gandhi aired anti-progressive and ant-scientific views in this book. The British too read it and promptly banned it for wrong reasons. They found it highly seditious. Gandhi was uncompromising in his attack on man’s unprincipled exploitation of nature and he did not spare the Western Civilization for its frenzied efforts to consider that science and technology would offer all what humanity needs. Gandhi was misunderstood on this score, for many of his detractors could not fully comprehend the far-sightedness and deep penetration with which Gandhi could predict what would happen to humanity after fifty years or so. As D.G Tendulkar, one of Gandhi’s biographers, pointed out even those who understood Gandhi’s position could not see that it was not a romanticized picture of the past. “The Earth provides enough to meet every man’s need but not for anybody’s greed”. To understand Gandhi one has to begin looking at his early experiments in South Africa in community building, farming, reorganizing daily life style of every individual who joined him in the efforts to “living in harmony with nature” through what are known today ‘ashrams’ or the communities he founded, both in South Africa (Phoenix Ashram and Tolstoy Farm) and in India (Satyagraha Ashram at Sabarmati and Sevagram Ashram near Wardha). These communities served as laboratories and meaningful value creation centres where Gandhi and his colleagues experimented and demonstrated with convincing success how each member of these communities could live in harmony with nature and foster a new consciousness in developing a community of producers and consumers who would limit their wants, respecting the vast majority of others who are deprived and struggle for basic minimum needs. These ‘ashrams’ also highlighted the salient aspects of nonviolence as an alternative way of life. The community life Gandhi developed in these ashrams highlighted the importance of bread-labour (manual labour), tree planting , agriculture, simple life, and crafts. In short, they were attempts at self-sufficiency without invoking the blessings or the temptations from outside. While they could be described to be bold experiments, by no stretch of imagination could anyone say they were utopian ideals, impossible to achieve. Let it be remembered that these four ashrams and the members of these communities later rose to the level of harbingers of a new revolution and bold experimenters who prepared the minds of freedom lovers and fighters for human rights both in South Africa and India, also capturing the imagination of people all over the world later. They ignited a spirit of unity,freedom, values of courage, awareness of human rights, social change and need to change the existing socio-political system. They also started dreaming of a new dawn of hope and change by harnessing the inner power that dwells in each of them. The recurrent principle and running of the community life in these ashrams was to live according to the rhythm of nature and in harmony with nature with minimum needs and not to exploit nature beyond taking what nature offers and in perfect agreement with the now-famous and oft-quoted remark of Gandhi. “The Earth provides enough to meet every one’s need but not for anybody’s greed”. Another healthy aspect of these Gandhian experiments was the stress he laid on considering the cities as the clearing houses of the village products. From this Gandhi developed the concept of decentralized economy which was geared to restoring the organic relations between man and nature, thus avoiding the pitfalls of environmental destruction and ecological imbalances. *May the plants be source of peace to all. *In Rigveda, the sky is called father and the earth mother. When the sky and earth are treated like the father and mother it is meant to establish a symbiotic relationship with the other objects of Nature thereby constituting what can be called the Universal family of animals and plants. From this, a theory of not only interdependence but respect for each other and the need to protect everything in nature has been developed over the years though this emphasis got diluted later leading to not only exploitation but even utter neglect of nature. Mahabharata advocated the protection of trees with utmost priority. *Worshipping of trees became a tradition and most of the villages in India had Vriksha Devta (Goddess of tree) and Sacred Groves. Tradition has it that in tribal belts there were instances of women marrying trees. The Chipko movement initiated by the environmentalist and Gandhian Sundarlal Behuguna was influenced by this great tradition with his hugging the tree project. *The importance of the eco-system which was uppermost in the minds of our forefathers, in maintaining the quiet rhythm and symphony of life ( not in the musical sense) has become a thing of past. We had a sustainable ecosystem which was rooted in a nonviolent ecology. Thus nonviolent ecology refers to a society which is economically and socially just, ecologically sustainable, non-killing and compassionate in relating to its environment. *Buddhism is eco-centric rather than anthropocentric since it views humans as an integral part of nature. Buddhism focuses on the interaction of mind and nature through the three practices of direct knowing, discriminating awareness and deep compassion. *By cultivating these three practices, one’s actions in relation to the environment come to be based in relationship and interconnectedness, rather than in dualistic subject-object modes of separation. Through this approach, one’s orientation to the world is fundamentally altered from dominant species to member of a community. *While environmentalism emphasizes that natural resources are limited, Buddhism is more direct in encouraging individuals to limit their resources consumption to the optimal satisfaction of the four basic needs of food, clothing, shelter and medicine. This vantage point renders ecology a very concrete and personal matter. Should it not be possible to deal with nature the way we should deal with ourselves ? We should not harm ourselves, therefore, we should not harm nature too. Harming nature is harming ourselves, and vice-versa. If we knew how to deal with ourself and with our fellow human beings, we should know how to deal with nature. We should develop the attitude that human beings and nature are inseparable. Therefore, by not caring properly for any one of these, we harm them all. The key to Buddhist ethics is the primacy of the mind. The Dhammapada begins with the words: “ All that we are is the result of what we have thought” (Smith 1958: 121). From positive thoughts flow positive actions and positive consequences, whereas from negative thoughts flow negative actions and negative consequences. Furthermore, the actions of an individual in the present life can influence the next one as well. The source of suffering is in the individual, and likewise the source of happiness is in the individual. Enlightenment derives from the understanding of this elemental reality (Saddhatissa 1970:33). Thus ignorance rather than is in the problems (Smith 1958:121). Wisdom and morality are mutually reinforcing (Saddhatissa 1970: 123-124). Accordingly, Buddhism would encourage the cultivation of environmental understanding through education as well as the practice of environmental ethics as basis for a nonviolent ecology. Since the first negative precept extends to all life, it includes forms such as insects which are not usually includes forms such as insects which are not usually identified as a concern of environmentalists. Also because of this precept normally Buddhism would not be involved in the kind of violence which is sometimes practiced by radical environmentalists (Manes 1990). A nonviolent ecology would realize its ideals through its actions toward all life forms, even those which are violent towards humans or nature. Education and persuasion rather than violent confrontation would be used to reach those humans who degrade or threaten other humans and / or nature. It also depends on following the Middle Way of detachment and moderation, while satisfying basic needs and avoiding greed. Meditation on nature is an important part of this process of reaching nirvana-the union with nature through the extinction of ego and of all mortal cravings. Thus Buddhism would not blame the eco-crisis, science, technology, industry, business, advertising, government, or some other amorphous scapegoat. Rather it would view the eco-crisis as the product of the collective behaviour of individuals who are driven by circumstance, ignorance, and/or greed instead of by wisdom, need, moderation, compassion and nonviolence. 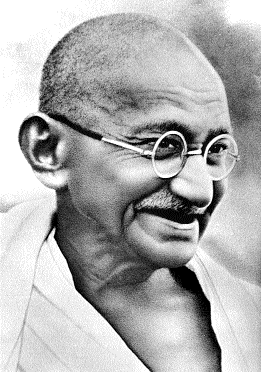 The importance of the efforts of Gandhi to encourage his associates and others to live in harmony with nature was not immediately welcomed but as he stood his ground he was able to convince his associates the validity of his experiments — whether it is on integrating all aspects of daily life or matter connected with a spiritual living in conformity with the universal character of human destiny. People are to be encouraged to take environmental issues as their personal concern. In order to drive home the importance of our common future, all efforts are to be harmonized keeping in view of the holistic nature of the problem. The spiritual and cultural aspects of survival cannot be under-estimated or ignored in the din of economic progress and development. Sustainability of the flora and fauna has to be the major focus. The Greens in Germany, inspired by Gandhi under Petra Kelly, spared no efforts to highlight the danger this planet faces from the unprincipled use of what nature keeps like a treasure for all her children from all times to come. Petra Kelly wrote “As human beings, we have exploited and controlled our environment. We have treated this environment like a river, with a seemingly endless supply of pure water. Only now it is beginning to dawn on us that the planet’s environment circulates in a close system, and that what we add to it, stays with us. The ozone system, and that what we add to it, stays with us. The ozone depletion, acid rain, and global warming are all related to human-generated emission in to the atmosphere… We must realize that we cannot make compromise when it comes to such substances as dioxin plutonium, lead and many other cancer-causing substance… Much of the development, as we have known it, has been based on the terrible assumption that big is beautiful. Huge dams, huge highways, and most terrible consequences. They have produced chain reactions of the environmental damage including the spread of diseases, floods, soil erosion and water, pollution. The dilemma of development has been that the very means by which it is achieved – namely industrialization has destroyed the natural resources which it is based”. The highlight of fifty two years of public life of Gandhi (20 years in South Africa and 32 years in India) was the constant endeavour he made to develop an alternative philosophy of life. Many of his practices or “experiments” invited sharp criticism and appreciation from both unorthodox or orthodox circles. Undaunted by what others said about his work, Gandhi in his characteristic style preferred to ‘walk alone’ in his brave experiments and leadership in creative living. The world watched with interest Gandhi’s transformation to the position of an outstanding proponent and champion of an alternative life style. He also consciously wove nonviolence into the matrix of daily life as an effective technique and a way of life to cleanse individuals and social and political systems and prepared the ground for a new global social order with local community and environment as the base and individual human being at the center place encouraging the ordinary persons that everyone can be an agent of change initiating a Human Revolution as pointed out by the great Japanese philosopher and President of Soka Gakkai International Dr Daisakku Ikeda . Dr Ikeda is a profound admirer of Gandhi and strongly argued in his now-famous “Gandhi Memorial Lecture” in New Delhi that humanity, particularly the new generation, has a lot to learn from Gandhi.